Birthday Budget: How Much to Spend on a Present? My daughter met a new friend this summer. They had an immediate connection, and then the next thing my daughter knew, she was invited to her birthday party. So having known this girl for just a few weeks, we had a predicament on our hands: How much should we spend on her birthday present? When our kids are younger they are invited to so many birthday parties. Some teachers encourage kids to invite everyone in the class. That can put a burden on our budgets. So how can we manage this expense? Experts recommend setting a budget and sticking to it. $20 dollars is a good base at which to start. If it’s a closer friend, perhaps consider increasing by a few dollars. But set a ceiling as well. If your kids are going to shop for the present with you, make sure they understand how much you are willing to spend. It’s a good lesson of budgeting and living within their means. Some parents like to stock up on presents when the see a good deal. That approach can save time and money. 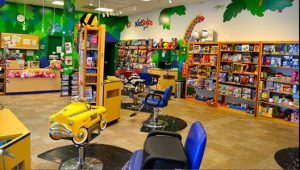 The next time you are in getting your child’s haircut, check out what the toy section of KidSnips has to offer. We offer reasonable gifts for kids of all ages. For more information click on: http://www.kidsnips.com/about-us/ or check out this video. Back now to my daughter and her new friend. I told her how much I was willing to spend ($20). My daughter didn’t think that was enough, so we compromised. I told her if she wanted to add on to the gift, she could contribute some of her babysitting money. She seemed satisfied with our arrangement and off we went to pick up the perfect, and affordable to both of us, birthday present.